Just a short post before I forget this myself. I have been struggling with two Hyper-V host servers loosing network connectivity every now and then. I have 3 servers in totalt, one of them never had this problem. The server simply stops communicating on all network interfaces at the same time. It’s still connected, but I can’t ping the default gateway. I have been through every setting multiple times, but finally I found this one setting on the network card properties that was different from the server that was working. 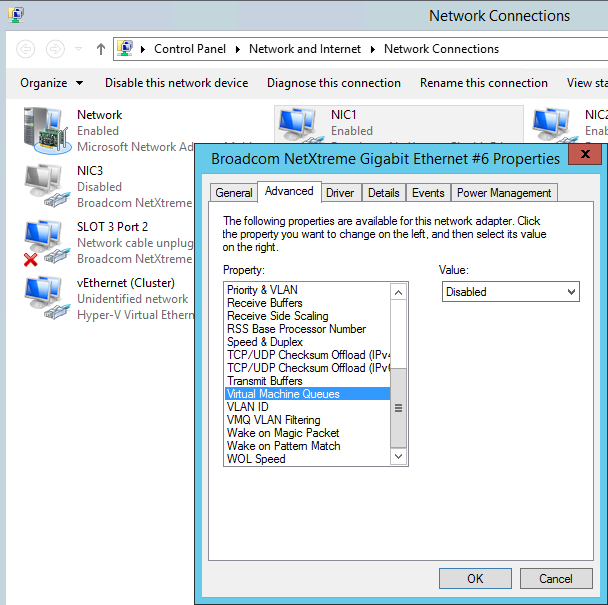 Under the network card properties choose Configure… and then click the Advanced tab. Find the Virtual Machine Queues property and set it to disabled. Haven’t had any problems after this change. As you can see from the screenshot we’re running Broadcom NetXtreme Gigabit Ethernet network interface cards and the servers are Dell PowerEdge R620, don’t know if it matters? Also tried updating drivers and firmware a couple of times, but without any luck.